I thought there might be a few people pottering along the Eastbourne promenade today, basking in the lazy mix of afternoon sun and holiday haze, but I could barely make my way through the stream of rollerbladers, cyclists and ice cream-lickers on my pre-marathon jog. The sea is definitely warming up (I caught my first bass of the season this week – and they’re about as fond of chilly water as I am) and a few brave souls were spashing around in the shallows. Most of the action, however, was a little further out – with windsurfers and sailboats aplenty in front of Spray Water Water Centre, just east of the pier. You can hire everything from them, with or without tuition, so no excuse not to get out there and have a bash if you’re feeling energetic. More kit and action is available near the Wish Tower – in the shape of kayaks for hire. 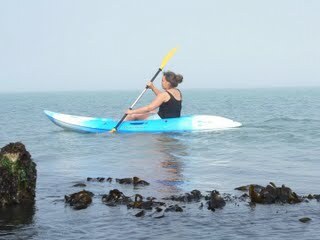 I came across a nice crowd who constitute Eastbourne Kayak and Surf – they’re open at weekends throughout May and then daily till the end of September, with kayaks for hire for only a tenner an hour so perhaps I won’t be the only kayaking there this summer. I hope I see you out there at some point – don’t forget to say hello to me when you come across a sunburnt ginger, floundering around somewhere in front of the Grand Hotel in Eastbourne.